Founded in 1976, leading publisher Hangilsa created a space for bibliophiles to bask in the beauty of great books. Today, that space is known as the Hangil Book Museum and boasts one of the more impressive book collections in the country, including various print collections by William Turner and 19th century French satirist Gustave Doré. Also on display are the first editions of the literary works of Milton and Chaucer and designs by the illustrator William Morris. It’s easy to spend an afternoon here browsing literary masterpieces, wandering the book shop and taking in the idyllic atmosphere of the museum’s cafe covered in books, but there’s more to see. In addition to the galleries and futuristic architecture, there is a kitschy, nostalgic appeal that blankets Heyri Village. It can be found in the quirky Toy Museum, the motnanyi (ugly doll) snacks for sale, the unexpected Elvis museum and the colorful facades of buildings that dot the community. 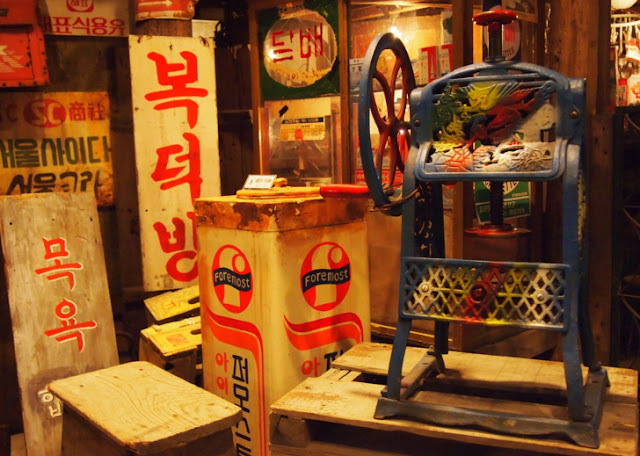 For a blast from the past, and a look into what Korea was like fifty years ago, check out the Museum of Modern History of Korea. Designed to resemble a neighborhood in the 1960s and 70s, the museum makes the visitor feel like he or she has actually traveled back in time, able to peek into homes and establishments common at the time. From the sounds of street vendors to the musty aroma to the detailed props, the museum does an incredible job at recreating an era. As you wander through the exhibits, you might find yourself yearning for another time and place. The Step building is another place to experience the quirks of the village. Dalki (Korean for "strawberry") is a famous red-headed comic character, and is the main attraction of the complex. Her face is plastered on the walls and featured in the products sold by the stores of the shopping area. In addition to a Dalki indoor playground for tots and a Dalki Korean-style bakery, there are also a number of businesses that offer various do-it-yourself art experiences, like pottery painting and jewelry making. Adults and children alike pack into these small workshops to embrace their inner artists. Don’t miss the bathrooms, which feature Dalki’s friend Dongchimee, a character known for his swirly brown hat and his penchant to poop. Adjacent to The Step is the I Like Dalki complex, a family-friendly three-story complex that includes a playground, gift shop performances and programs. 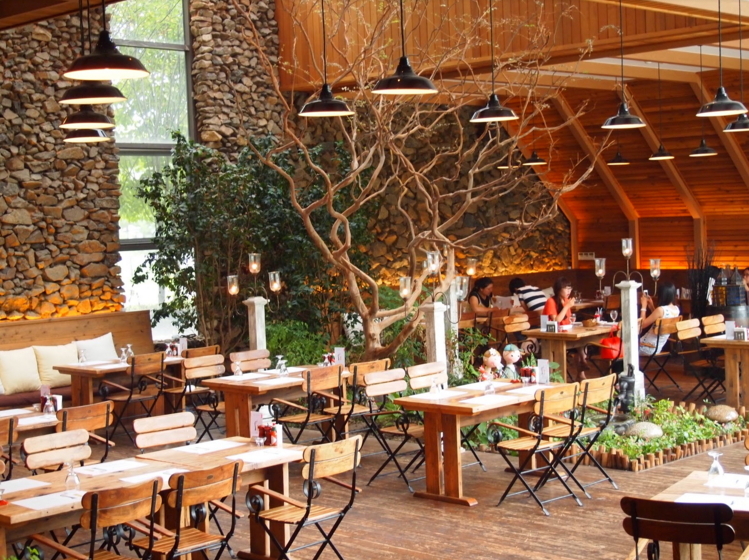 If you happen to be around at dinner time, grab a seat at (or at least take a peek in) Farmer's Table, which fans of “Boys Before Flowers” and “Gentleman's Dignity” will instantly recognize. Lavishly decorated, this dining space was actually the cafeteria of the K-drama, which is arguably the most famous in K-drama history. Photos of the F4 boys and Geum Jan-di (Ku Hye-sun), the show’s protagonist, are hung throughout the place, and the food—a Korean take on Italian and American cuisine—isn’t bad, either. Finish off your walking tour by stopping by Seoul Action School, formerly known as Stunt Academy, a center that has been training acting professionals since the late 90s. Established by director and screenwriter Kim Yeong-bin and actor Jeong Du-hong, it has since played an integral part in developing the Korean film industry by revitalizing action film. Today, it continues to cultivate the acting, martial arts talents and action performance of both new and veteran actors and actresses. It was even featured in the famous sit-up scene in “Secret Garden” as Ra-im’s (played by Ha Ji-won) workplace. Heyri is a unique destination and is in a state of constant planning and expansion. Construction is to be expected in a place like Korea and it’s unsure if the increase in size will change the dynamic of the community. Only time will tell, but until then, its nostalgia for the past, design for the future, oneness with nature, and all of its interesting quirks make it the perfect day trip from Seoul. Koreans are no doubt the most beautiful people as well as hardworking. This is a good piece of sharing about the history of korea which most of us don't know.